"We must pay more attention to the ways in which the tobacco industry is capitalizing on societal changes to target women, such as marketing cigarettes to women as a symbol of emancipation. Women's empowerment must continue, but does the bad necessarily have to follow the good?" -- Sara C. Hitchman, co-author of "Gender empowerment and female-to-male smoking prevalence ratios." the 1980s, I remember seeing glamorous Virginia Slims cigarette ads like these. 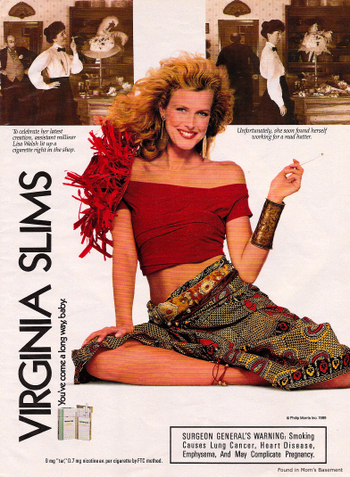 This was the ultimate campaign to market cigarettes to women as a symbol of empowerment. 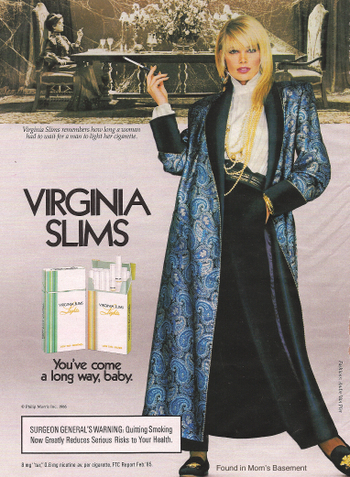 Smoking was marketed as a choice a strong, confident liberated woman could make for herself as an expression of her hard-won feminist freedom from patriarchal society. As smoking becomes more of an American social taboo, we might think women have advanced far enough to resist the manipulation of Big Tobacco. And yet, empowerment is still being used as a tactic to target women in developing nations. According to a study published by the World Health Organization, millions of women in developing countries risk disease and early death in the coming decades as the tobacco industry exploits their rising economic and political status. The United Nations Development Program measures empowerment based , such female representation in government, voting rights and comparisons of male-to-female income in each country. The study shows that men are currently five times more likely to smoke than women in countries with lower measures of female empowerment, such a China, Indonesia, Pakistan, Saudi Arabia and Uganda. In countries with relatively high female empowerment, such as Australia, Canada, Norway, Sweden and the U.S., the gap has been closed. Dr. Douglas Bettcher, Director of the Tobacco Free Initiative at WHO, says, "The tobacco epidemic is still in its early stages. Strong tobacco control measures such as bans on tobacco advertising are needed to prevent the tobacco industry from targeting women." Today is World No Tobacco Day. It's part of the WHO's Tobacco Free Initiative. Get on board for the sake of women's health worldwide. Smoking was down in the U.S. during 2010 -- for both women and men. See the stats at www.quitsmokinghub.com.